This Forrester Study provides a framework and customer example to help readers evaluate the potential financial benefits of investing in ServiceNow Customer Service Management. 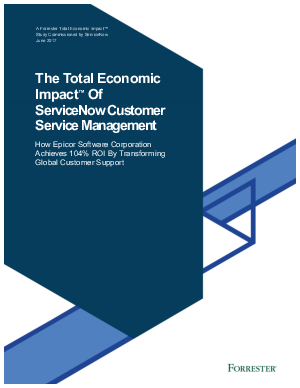 To understand and illustrate the benefits, costs, and risks associated with ServiceNow, Forrester interviewed Epicor Software, the world’s sixth largest ERP software provider with $850 Million in revenue, that has been using ServiceNow Customer Service Management since October 2015. Download this study to evaluate the Total Economic Impact of using ServiceNow Customer Service Management to deliver effortless, connected, and proactive service.